Registration open for the Revolution Challenge. Register online to reserve your spots as they fill up quickly. It's gold for Revolution 14 Kiley! Revolution 15 Shae takes gold in Durham! Revolution 16 Walks Away with Gold! Revolution 16 Hanna played their hearts out in their Carolina Region tournament in Henderson and walked away with the gold medal. Congratulations ladies! Congratulations to Revolution 18 Bill for their first place finish in their Carolina Region tournament over the weekend in Greensboro. Congrats to Revolution 13 Keagan for playing hard and bringing home the 3rd place trophy in their very first tournament in Rocky Mount! Nice job ladies. Congratulations to Revolution 13 Jen for their first place finish in the first tournament of the season at the Carolina Kickoff in Rocky Mount. Get more information about our Travel Teams tryout information. We are happy to offer a Middle School Skills and Drills Camp for any 6th-8th grader planning on trying out for their middle school team. We will cover all volleyball skills and incorporate game play. Dates: 8/22-24, from 6-8P. Cost: $110. Congrats to our 13U crew, 1st: Gracie, 2nd: Tori, 3rd: Hannah. For our 16U crew the top finishers, 1st: LeAnn, 2nd: Taylor, and even tho she was out of town 3rd: Izzy. Congrats to our Top 3 finishers for the May Revolution Challenge! Revolution 14 Red traveled to Myrtle Beach, SC to participate in Winter Bump during the MLK weekend, facing a lot of tough competition. Monday they went undefeated to capture the medal. 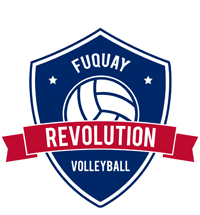 During an in-house round-robin tournament to get ready for competition, all 4 Revolution teams competed against each other on New Years Day with 17 Blue winning it all with only 4 players. Nice job ladies! Fuquay Revolution is partnering with USports! We're excited to announce that Fuquay Revolution will be partnering with USports for Conditioning this year! We're so Proud of everyone who made their Middle School and High School Volleyball teams! Congratulations!! Proud of what we accomplish every season, on and off the court! Just let us know when you are availabe! Any boys ages 12-16 looking to play volleyball, please contact us! Congrats to our top 3's: May (Monday): Tera, Kathryn, and Isabelle. May (Tuesday): Keagan, Mae, and Jenna. June (Monday): Cassidy, Hannah, and Mackenzie. June (Tuesday): Isabelle, Leah, and Alina. We offer camps for Middle and High schoolers and cover all volleyball skills and incorporate game play.